Ideas for a potted vegetable garden, container garden plans, designs, and pictures! 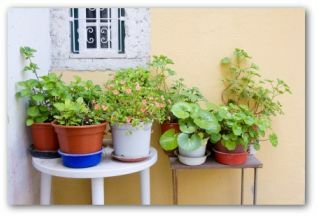 Get started with gardening in pots and containers for a very fun vegetable garden layout. Gardening in pots using seeds or small vegetable plants, is a great way to save money and experience the joy of vegetable gardening. Most vegetables, herbs, and a few tropical plants can be sown and successfully grown in a container or potted vegetable garden. You choose the varieties to grow; selecting the very best for flavor, yield, and pest deterrence. 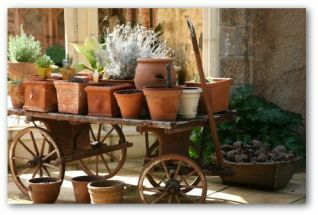 Potted gardens are a great and convenient way to grow vegetables on a patio, porch, deck, balcony or in a flower bed. All you need is a sunny location, and a source of water nearby! 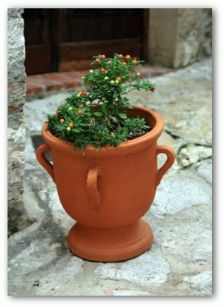 Use your imagination when it comes to choosing pots and containers for your garden. 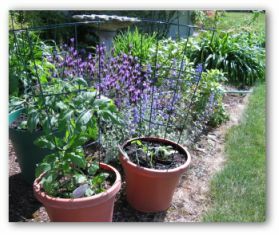 Much of the fun in gardening comes from the small pleasures of choosing what to grow and finding just the right container to add the perfect touch to your vegetable garden plan. With only very basic horticultural skills, you can plant a seed and grow it through to production. Whether you plant a pot of tomatoes or cucumbers, it is exciting to watch the germinated seed form into a seedling, then into a plant, and last, into vegetables to serve at family dinners! Transplants from the garden shop provide a quick start for a potted garden, but the selection is often limited. One section of seedlings may be marked simply, “cabbage” rather than Gourmet or King Cole or varieties suggested for your state. Gardeners in search of exotic herbs and unusual vegetables must often start these plantings from seeds because unique transplants are rarely available. Seeds are easy to sow and usually will produce transplants in 4-6 weeks. Garden centers typically are a good source for fresh seeds but online companies offer a far more extensive variety. Seeds are normally packaged and tested for the current and upcoming year. Germination is assured if the packets are kept dry and at normal room temperature. When planning a potted garden, it is not necessary to buy locally grown seeds. Weighing heavily on the availability of seed, is the fact that conditions for cultivating the majority of vegetable gardening seeds is better for the western half of the US. If you grow your vegetables from heirloom seeds, you can collect seeds from your garden each year, and use them the following year. Choose plant varieties for your potted garden that have been tested and are recommended for growing in your area. These plants will demonstrate extra mustard (excuse the pun) for producing and proven resistant against common pests. You can use soil-less seedling mixtures for your potted vegetable garden to avoid pests such as cause fugal rot. Make the mixes at home using peat moss, vermiculite, and lime to adjust the pH level. Fertilizer can be added to the mix or applied after the seedlings sprout. Begin fertilizing plants immediately after seeds germinate. Formula makes enough mix to fill three 6-inch pots. Store extra mix in a clean trash can or plastic bag. Avoid contaminating the mixture with other soils. The formula supplies enough mix to fill 45 6-inch pots. Plant seeds for your vegetable garden in shallow containers. Young plantings only need an inch or so of space for roots to grow during the initial weeks. This is where innovative gardeners like to show off their creative side by choosing unique pots. 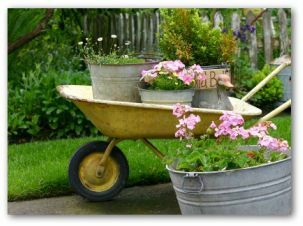 From planting in a child’s wagon, old wheel barrow, to a wooden half barrel, the sky is the limit on the containers you can use for your potted vegetable garden design! As long as the container provides proper drainage, use your imagination and recycle discarded materials into new homes for your plants. Have fun with this part, and be as creative as you like. Fill containers with planting mix to within half an inch from the top to allow for watering; wet fully. Sow a couple of seeds to a small sized pot. Cover larger seeds with growing medium or scatter smaller seeds on top. Potted vegetable gardens are a great way to express your creativity, while growing fresh delicious vegetables for your table. You might have a few extra vegetables from your potted vegetable garden to freeze, preserve, or share with friends and neighbors. Everyone loves a gift of fresh garden produce; what a great way to celebrate a special occasion.